Zip Backup to CD is designed to backup your data files using the standard Zip file format, allowing backup files to be viewed and restored with most zip file utilities. 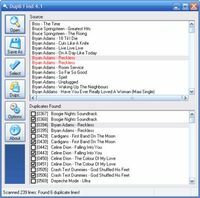 Zip Backup to CD distributes the files to be backedup in several stand alone Zip files of a size fitting a standard CD (CD-R) or a size chosen by the user and writes it to CD/DVD. Therefore it can backup your files to hard drives, network drives, ZIP drives, JAZ, Syquest, CD, DVD, and most other removable media's. 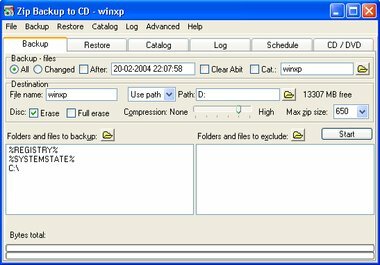 Zip Backup to CD supports conventional or Universal Naming Convention (UNC) file names, allowing access to all local and LAN Directories using Industry standard 32-bit long directory and file names. The integrated zip-extractor allows the restoring of your backup files. Zip Backup to CD has its own scheduler supporting unattended auto-backup and scheduling of any specific Time or Date, Day of the week or Month. It also has command-line support for further automatisation. Zip Backup to CD supports data backup of in-use and open files as long as the application that is using the file does not have it locked for read access. Therefore you can backup the complete system if you are running Windows 95, 98, ME. If you are running Windows NT, 2000 or XP you have the option to include the registry and system state, which enables you to make a complete system backup.